Gables Hout Bay är ett Cape Hollands boende mycket hemtrevligt dekorerade med afrikanska influenser i en av de mest prestigefyllda byarna i The Cape. Känn vård och personliga känsla i denna rymliga Villa, varje rum ökar med karaktär. 20 minuter från Down Town Cape Town. Villan är perfekt för en stor eller två familjer / grupper. Den består av en huvudbyggnad (6 pers) och en sammankopplade stuga (sover 5). Totalt 11 sovplatser. Stugan och huvudbyggnaden har en mellandörr med ett jämnt flöde, som om de var en enhet, men båda helt fristående med möjligheten att använda separata ingångar. 5 rymliga sovrum, 4 badrum, 2 salonger med franska dörrar som leder ut mot trädgården med mousserande sol uppvärmd pool och jacuzzi, utanför BBQ (braai) anläggning. Lounge set med skumma lock. Handdukar och sängkläder tillhandahålls. Säkert av parkeringsplatser på fastigheten i totalt 4 bilar, bakom fjärrstyrda säkerhetsgrindar. The property was very spacious and had all the facilities you could imagine. The wood burner was superb on the cold winter nights and the pool was even warm enough for a mid-winter swim. Anita and Gerrie were so helpful it was amazing, they couldn't do enough to help and were so responsive. The location of the house was superb and we were able to walk to the beach and shops/cafes in town. We spent our holiday in this house last week ! 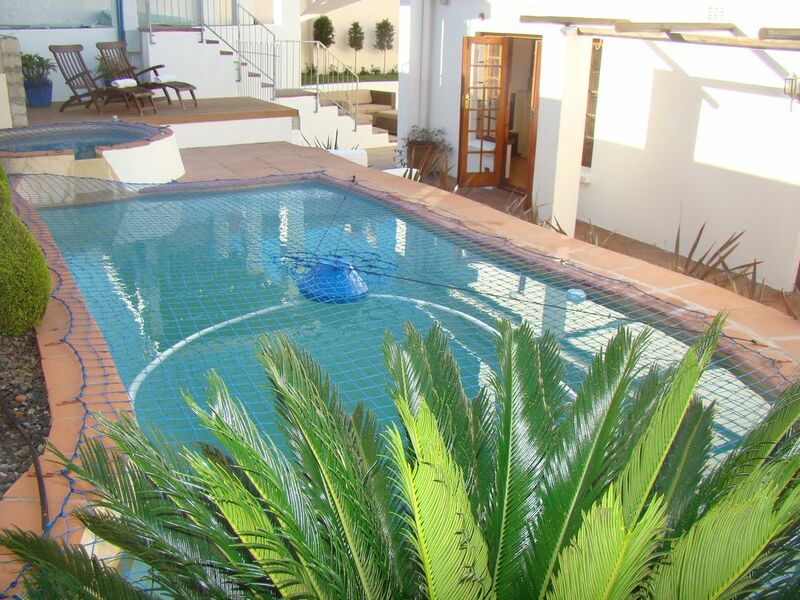 We were 2 big families with 7 children and we enjoyed a lot our staying in this property with his swimming pool and barbecue.We loved Hout Bay and Cape Town our trip in South Africa.... so many things to do and to discover! We had a lot of place and and the house is very well equipped very clean, class safety and well located : every facilities were near it and to discover Cap town too ! We appreciated a lot Anita and Gerrie 's kidness and their hospitality. They were available and so nice. Thank you Anita and Gerrie for everything! We hope to come back one day! We were absolutely happy with our stay. Everything was great and we loved the house, the big kitchen and the pool. Anita and Gerrie were wonderful hosts and made us feel like home from the first moment - thanks to both of you. Our vacation in Hout Bay began with a warm greeting from Anita and Gerrie. The house was lovely and had everything that we needed. When faced with a small problem regarding the internet, it was handled quickly and efficiently. During our week at The Gables, the USA was hit with hurricane Sandy. Anita & Gerrie phoned us expressing their concern and gave us options if we needed to change our departure. Their hospitality, knowledge, and professionalism was appreciated. We recommend using them for your next unforgettable holiday. P.S. Have them put you in touch with Johnny for tours. Hout Bay är en av de vackraste och mest populära platserna på Kaphalvön. Bara 20 minuter från Kapstaden och med de tre vägarna som leder till allt underbart att köra. Den livliga staden Hout Bay med alla sina restauranger, butiker och den härliga stranden ligger pittoreskt i en vik med majestätiska berg som omger den. Det är den perfekta hemmabas för din semester för att utforska Western Cape. Inom en cirkel av högst 45 minuter, hittar du alla hotspots gillar; Godahoppsudden, Robbenisland, Taffelberget och dess Cableway, Botaniska trädgården Kirstenbosch, Two Oceans Aquarium, Boulders Beach, Greenpoint hantverksmarknad, vin vägar Constantia och Stellenbosch, Chapman`s Peak Drive, 7 köpcentra bland dem berömda V & A Waterfront och Canalwalk (Century City), de vackra stränderna i Hout Bay, Noordhoek och Camps Bay. Du får aldrig uttråkad i Kap! The house is for rent the whole year round! Please check for real time availability. Rates depending on number of guests, duration of stay and season. The non – refundable 50% deposit is required to confirm a booking. The 50% non – refundable balance is due to be paid one month prior to arrival.